Join Katie Sanderson for a day of prepping, eating and discovering the simple joys of vegetables. She will be taking inspiration from the seasonal organic growers of Ireland as well as a few tips and tricks from further afield. Katie will take a creative approach to vegetable preparation with an emphasis on healthy things. “A chance for me to share with a small group of people some of my favorite recipes old and new. Some tips on wasting less, a small bit of fermentation and good broths for winter. And a little Asian inspiration because I cant help myself. kale with sunflower tapenade garlicky yoghurt & herbs. Make you feel good on the inside Veg broth with seaweed, spuds, courgette, tomato or what-eever you can get, then add grain, fresh is best. make lots eat well. Leftover seaweed pickle with aubergine and pickled pink onions. Red cabbage easy to do kraut ( everybody takes home a jar) we will drink shots in class to give our tummys a good buzz. 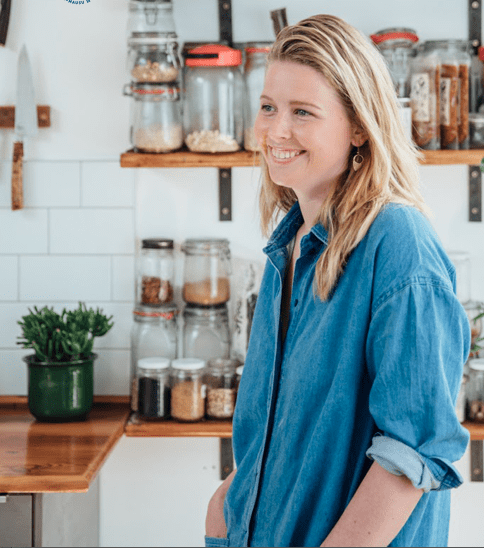 Katie Sanderson has spent time in enough influential kitchens to fill this entire short bio…..but really her passion lies in projects where she connects with the food, the place and the people in equal measures. Dillisk, a temporary restaurant in Connemara which she created with her partner Jasper is the prime example of this. She loves vegetables. She is not a vegetarian but would choose a freshly shelled pea over a fillet steak in a heartbeat. if you are a student, unemployed or recently retired we would like to offer you a €20 discount on this workshop. Apply the code EI20 at the checkout. ID will be required on the day.